The next time you find yourself dining in Dubai (as one does), consider wetting your whistle with a $150 bottle of non-alcoholic sparkling white wine, with flecks of edible 24-carat gold leaf. You see, the bubbles make the gold dance, like a very expensive snow globe. Sometimes news dispatches from Dubai read more like snippets from some science fiction novel about life on a mega-luxurious space station. That's according to Reuters. Islam says liquor is off-limits, so there's a thriving market for tasty substitutes in the Middle East. (The wine is made by Dismark Products, a Spanish company.) Which doesn't explain the gold. Why add the gold? 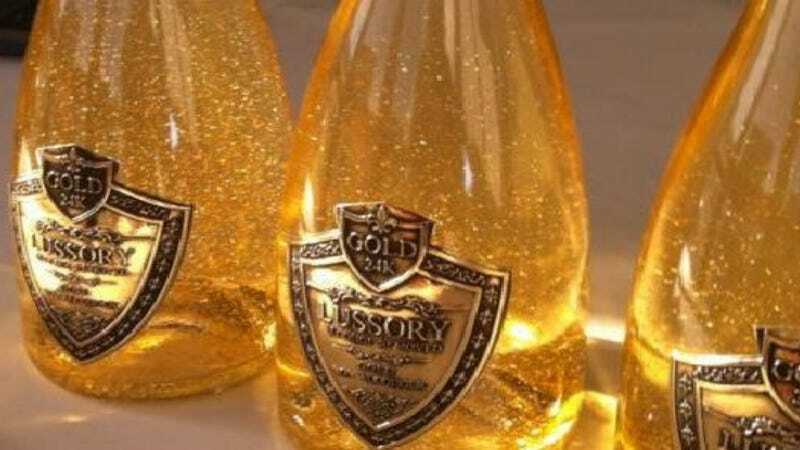 Well, I'm glad you asked: "It has gold in it for no good reason apart from it's fun, it's fantastic, it's frivolous, it's totally Dubai," explained Tony Colley, who manages Lootah Premium Foods, which distributes the drink. If that sounds ridiculous, it's only because you're not thinking this through: "For people that cannot drink … it's a nicer thing to have with a steak than a Pepsi," said restaurant owner Josh Benson. Everyone knows Pepsi just ruins the taste of a good steak. Jay Gatsby salutes you, Dubai.